GL's enhanced PacketCheck™ is a comprehensive PC based Ethernet / IP test tool with BERT and Throughput testing abilities. It is very easy to use as a general purpose network performance analysis tool for 10Mbps, 100Mbps and 1Gbps LANs and WANs. Throughput up to 800 Mbps can be easily tested. The application truly takes confusion out of Ethernet testing at all protocol layers - from raw Ethernet frames to IP/UDP packets. 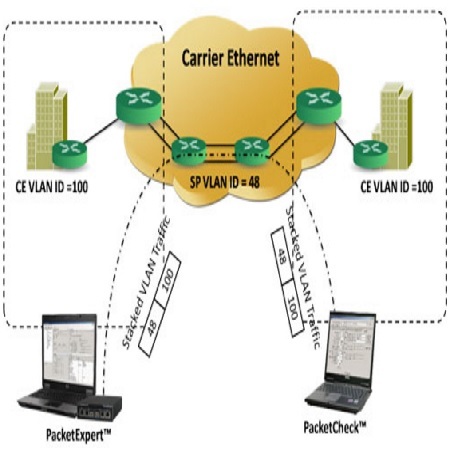 PacketCheck™ makes use of PC's network interface card (NIC) to transmit and receive Ethernet or IP packets over the network. The application generates multi stream Ethernet/IP/UDP traffic with on-demand bandwidth (up to 800 Mbps) and measures end to end performance such as Bit Error Rate, Total Packets, Packet loss, Out of Sequence Packets, and Erred Packets. Additional features include transmission of pre-recorded file traffic, GTP traffic simulation, Bursty and Fixed IFG (Inter Frame Gap) traffic generation mode, Delay measurements, impairment generation, and BER testing capability with provision to generate PRBS patterns or user–defined test patterns. It also includes a Command Line Interface (CLI) to support all the GUI functionalities of PacketCheck™ through simple commands, allowing easy scripting and automation of the testing. Also included is a powerful Report Generation feature to view report in XML and PDF formats. PacketCheck™ can operate on any of the layers - Layer 1 (Physical), Layer 2 (Data Link), Stacked VLAN (Q-in-Q), Layer 2.5 (Stacked MPLS), Layer 3 (Network), and Layer 4 (Transport) of the OSI reference model.